Today I’m going to share how I made the cover of my Journaling Bible extra unique. The secret — yes — velcro! I bought the little teal cross at Hobby Lobby for about four bucks because I thought it would look awesome on the front of my Journaling Bible. Then I started thinking about how the pages would not lay flat for me to write and draw if I decided to have a huge cross glued to the front. Fortunately, velcro came to mind. It was super fun to ask people, “How do you think this cross is attached to my Bible?” and then do the little show-and-tell this week. You’re never too old for show-and-tell. Speaking of show-and-tell, I saw this guy as I was driving to work last week. It was amazing to sit in my car and watch this bear for about five minutes. I had never seen a bear while I was driving before (even though I did have one come in the yard with me one time while I was reading a magazine). Seeing the bear was one of my big praises for the week. I always marvel at God’s creation (preferably from a safe distance, haha). Challenge #5: Do something in your Journaling Bible that will bring you joy this week. Maybe you’ll choose to velcro a cross onto the front like me, or maybe you have something else in mind that will make you smile when you look at it. Do you know what Hephzibah means? My delight is in her. That is what Hephzibah means in Hebrew. In Isaiah 62, that is what God says He is going to call Israel — and when I read the scripture today, I think of all of us who are true followers and believers in Christ. Isaiah 62 itself starts out by describing Israel’s poor standing because of mistakes made in the past, but the prophetic message is that Israel will be restored. The word picture here is so beautiful. I am not a Bible scholar, just a Christian who is learning more about God’s word as I Bible journal, so I would encourage you to do your own study into the passage. If you really want to dig in, here is a commentary that was written in an understandable way, and here is another good commentary. Yet, what I am seeing here is a prophecy that Israel would overcome a historical time of shame and also that Christ would come (Isaiah is a book in the Old Testament), and I am also seeing a picture of the church as the bride of Christ (an idea that is presented in the Gospels and Revelation later in the New Testament). Hephzibah — my delight is in her. Those words bring me so much joy in my soul. God can take what is broken and desolate, and he can see the promise in it, even at times when no one else can. He can change hearts and bring growth. This verse makes me think about mistakes that I made in my Christian walk in my early twenties, and it reminds me that God has forgiven me. It reminds me of how far he has brought me in my journey. The word delight shows me of how deeply he cares. My wedding anniversary is this month, so I think of the bride I was many years ago and the wife that I am for my own husband. Yet, the love that we have cannot compare to the enduring love of Christ for the church. So often, God in his grace gives to his followers beyond what we deserve. “Double portion” stood out to me. When I took communion later that morning, two pieces of bread were sticking together. Not realizing it, I took them both. As I felt the bread in my hand, I realized I literally had a “double portion,” which brought a smile to my face as I remembered the verse. What I want to leave you with today is that, as a believer, God treasures you. Challenge #4: Create a piece of art or a page in your Journaling Bible that celebrates how God sees you as a believer in him. Include a verse or words that speak to you. Hint: Day Two of the Flourish Bible Journaling Conference has an excellent tutorial from Scripture Doodle on how to create a “she” portrait. Posted on May 8, 2018 May 8, 2018 Categories Bible JournalingTags Bible Journaling, Bible Journaling Challenge, Bible verse about delight, Hephzibah, Isaiah 62, she portraitLeave a comment on Do you know what Hephzibah means? Isaiah 64:8 But now, O LORD, You are our Father, We are the clay, and You our potter; And all of us are the work of Your hand. Whether you are a stay at home mom who could use some encouragement or a working mom who feels like you need a break from the to-do list, Bible journaling is a spiritual practice that can renew you and remind you of how God sees you — even when your day-to-day routine might leave you feeling unseen or under-appreciated. Getting yourself into a good spiritual mindset will impact how you interact with your family. A good process to get you started is to pray, read the scriptures, ask what the scriptures are communicating to you or showing you about God, and then create your Bible journaling page based on that. All of the washi tape and bling are fun, but you can do this with a regular art sketchbook and your child’s colored pencils if that’s easier on your budget. For me – the huge literature geek that I am – looking up the words of verses in their original Hebrew or Greek and then considering the original meaning of the verses is one of my favorite ways to gain insight as I journal. Bible journaling together as a family is a cool idea, but you will want to keep the age of your children in mind. A younger child (like my Pre-K son) will do better with a sketchbook than a Journaling Bible. After all, you will want to teach your child to honor the Word; a younger child might have trouble understanding why it’s okay to color in the margin but not on the words. I know some people feel okay about covering up the words in the Bible when they journal, but I am not one of those people (I still like to look at what they are creating, but I personally do not want to cover the verses). When adults color over the words, hopefully they are still taking the words to heart, while young children might not have the understanding that they are covering sacred words. Teaching your child verses and truths through Bible journaling is so commendable, but respect and reverence are important to communicate too. A great option is teaching your child to do tip-ins with paper and washi tape (you can find how to make a tip-in online pretty easily, but ask me about it if you have questions). The child can write and draw on the tip-in, and it will fold up to still reveal all of the words. Middle school aged children do great with Bible journaling. I know this because I lead a small Bible journaling club for middle school students. This is the type of template that we use often. The students draw and watercolor, and then we glue the template into the margin (Or use it as a tip-in. Yes, I really like tip-ins). Since Bible journaling incorporates prayer, reading the Word, and thinking about the Word, it is a great opportunity to communicate your faith when you do this together. Yet, Bible journaling as a family has a different dynamic than using Bible journaling alone as a quiet time. The quiet, alone times are important too. Deuteronomy 6:5-7 You shall love the LORD your God with all your heart and with all your soul and with all your might. These words, which I am commanding you today, shall be on your heart. You shall teach them diligently to your sons and shall talk of them when you sit in your house and when you walk by the way and when you lie down and when you rise up. Just as family Bibles used to be passed down in families, think about your Journaling Bible as something that you can use to communicate spiritual heritage. It could be passed down in your family someday. Seeing Bible verses in your handwriting could be a beautiful moment for the next generation. I plan to dedicate a page to my spiritual heritage through my grandma soon; she was a devout woman who loved God with all her heart. Even if the art is not always perfect (or even if it’s pretty bad), it is a tangible connection to you and your spiritual journey. Remember to write down times that God answers your prayers or He teaches you something new. Please join me by following Bible Journaling Journey via email or WordPress Reader. I plan on doing a giveaway next month. I hope to see you here! Challenge #3: Think about how you can create a legacy with your Bible journaling. Pray about how God can help you use it to communicate your faith or to put you in the right mindset to make a real impact wherever you are. The Flourish Bible Journaling Conference is being offered online right now. I’m not affiliated with the conference, but I am attending it via my cellphone! I just watched the Day One videos and thought they were fantastic. I am looking forward to what’s going to be offered for Day Two. I’m attending the free conference option because I’m a #poorschoolteacher. 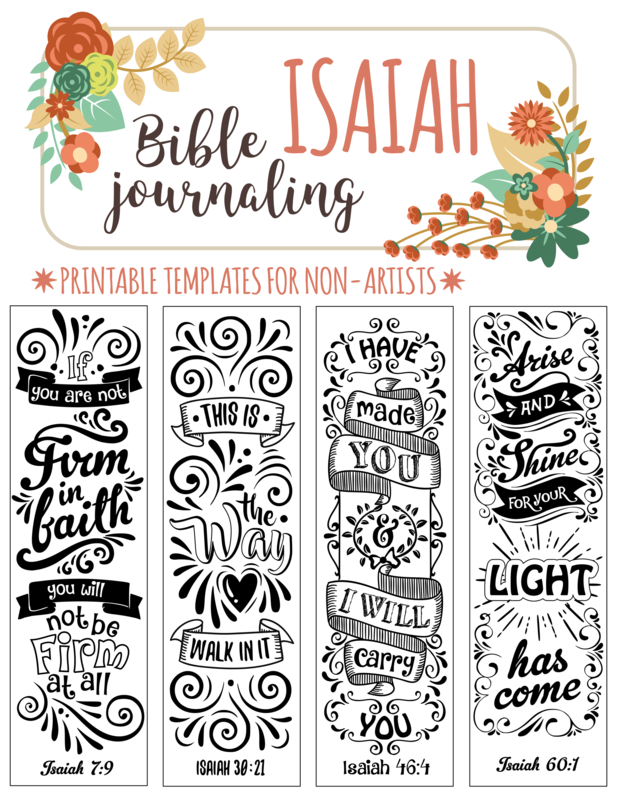 The site also has a beautiful free printable that you can use in your Journaling Bible by creating a tip-in with washi tape (the conference videos will teach you how to do that). I plan on using the printable with the students in my after-school Bible Journaling Club this week and showing them how to use it as a tip-in for their Bibles! Yay for free stuff, and a huge kudos to the women who are offering their wisdom, skills, and spirit-filled words in the videos. Posted on April 25, 2018 April 25, 2018 Categories Bible JournalingTags Bible Journaling, Flourish Bible Journaling Conference, Free Conference, Free printable2 Comments on Check This Out! Do you have days when you feel powerless? As Christians, we know that everything is not in our control. Yes, we have many choices that we make in the day, but God often puts us in situations where we must surrender to His guidance. Even as He communicates, we don’t see the whole picture — so we just have to trust. Where is our power? So much more is accomplished in prayer than we could probably comprehend this side of Heaven. If you have asked Christ to come into your life, forgive your sins, and give you life eternal with Him, then you have the Holy Spirit as your helper. You also have the sword. As we practice Bible Journaling, we have the opportunity to make the sword a part of our daily armor. That is one of the things that is so beautiful about Bible Journaling — encounters with the Word are what bring us strength. We are reading the Word, speaking the Word, thinking about the Word, and putting that experience into a creative expression that will help us remember to practice the Word in our lives. In doing so, we are sharing our testimony about what God has done for us along the way, and there is power in shared testimony as well. No, Bible Journaling is not just doodling a pretty picture. It is preparation for the day. Pick up your sword! The Holy Spirit will bring the verses to mind when you need them. In Luke 24:13-35, Jesus appears to his disciples after His resurrection, but they do not realize it is Jesus that they are talking to yet because they are so deep in confusion and sadness after the crucifixion. Jesus begins to remind them of scriptures as they walk together, and eventually they reach a place to eat together. Christ was literally among them, and he quoted the scriptures to remind them of the bigger picture. People have been martyred for the very Bible we read today. The man who translated the Bible into English (what was then Middle English, for those of us who really like to geek out on language) faced steep persecution for translating the Bible into a language that common people could understand. When we open the word, we are connecting to ancient words, ever true. At one time, people were hand-copying the words into illuminated manuscripts. Now we are interacting with those same words in our Journaling Bibles. Bible Journaling Challenge #2: The Word of God is the Sword of the Spirit. What does that mean to you? Hand-letter a verse inside the shape of a sword, or draw yourself holding a sword. What is the heart behind the art? Bible Journaling is more than paint and pens on a page. It is an act of worship toward God. Every time we Bible Journal, we have the opportunity to worship in an acceptable way that shows reverence and awe. For me, personally, that means I pray and read the Word before I journal. As I journal, I am careful not to cover up the actual words — the whole point of Bible Journaling in the first place. Without the Word, we would have no reason to do Bible Journaling in the first place. Some people use light watercolors that allow the verses to still be seen and read. That feels okay to me — but ask yourself, and ask God in prayer, how can I keep this practice pleasing and reverent to You? This is not scrapbooking or mindless doodling. No, I don’t have to be Picasso or Leonardo or Monet to Bible Journal. In fact, a little reminder of my own humanity in the process is just fine with me. I’ve heard that the Amish sew mistakes into their quilts on purpose to show humility. Jesus was the only perfect person, God in human form, and that is something to be glad about. I don’t have to be perfect. I do need to make sure I’m doing this with the right heart, though. I shouldn’t be doing it for compliments (Although, hey, if you have some words of affirmation, I do like that. Shout out to the Five Love Languages. Just sayin’…). I shouldn’t be doing this as a mere creative outlet. The reason I Bible Journal is that I have actually heard God speak to me in his still, small voice through the process. God has communicated with me through it. That’s why I do believe it is pleasing to Him. I have learned a lot too. I never thought much about the Hebrew or Greek words in verses until I started Bible Journaling and looking words up in their original translation. As a true word geek, that is fascinating. Your understanding of the scriptures can become so much richer when you do this. Why do you Bible Journal? You don’t have to tell me, unless you want to, but definitely think about it. At Bible Journaling Journey, I want to share my Bible Journaling thoughts and experiences with you and also give you lots of creative ideas and prompts to use on your own journey. Please click the follow button on my site to receive every post and be entered for an upcoming giveaway. Bible Journaling Journey is not on any other social media at this time. I want to offer you something to think about in one spot without getting caught up in the images, chatter, and distractions of what is already out there on social media. I’m not against social media (in fact, I would love it if you mention my site on yours) — but right now, let’s pretend this is my home, and I am opening the front door to welcome you in for a real chat. We can sit down at the table with cup of tea or coffee and open our Journaling Bibles together. Come on in. If you would like for me to share your work, or you want to do a guest post, I welcome that. Just send me a note on my contact page. Bible Journaling Challenge #1: What does it mean to worship God with reverence and awe in your Bible Journaling? Create a page based on Hebrews 12:28. What is the heart behind your art? Do you see Bible Journaling as worship? If not, ask God how you can turn it into a form of humble worship. God bless your journey today. See you soon. Stay tuned here in the next couple of weeks for a new post and a giveaway for site followers.